My article on Sudanese museums and politics of identity in the transitional period 2005-2011 published in Egypte-Monde Arabe 5-6 (2009) on Heritage-Politics in Egypt and Sudan is now available on line on revues.org along with the rest of the book. This article is part of the chapter 3: Politicisation and instrumentalization of Heritage in Sudan. This topic was investigated for the first time. The chapter comprises resourceful contributions of Iris Seri-Hersh (Iremam, Aix-en-Provence) on the recurrent use of the narratives of the Mahdiya in Sudanese politics, Ida Dykorn Heierland (Bergen University) on the political and economic use of archeological heritage in Naqa, Coralie Gradel (SFDAS, Khartoum) on the involvement of Lille III University in Sudanese archaeological research since the 1950’s and Constanza de Simone (UNESCO, Cairo) on the projected museum in Wadi Halfa. 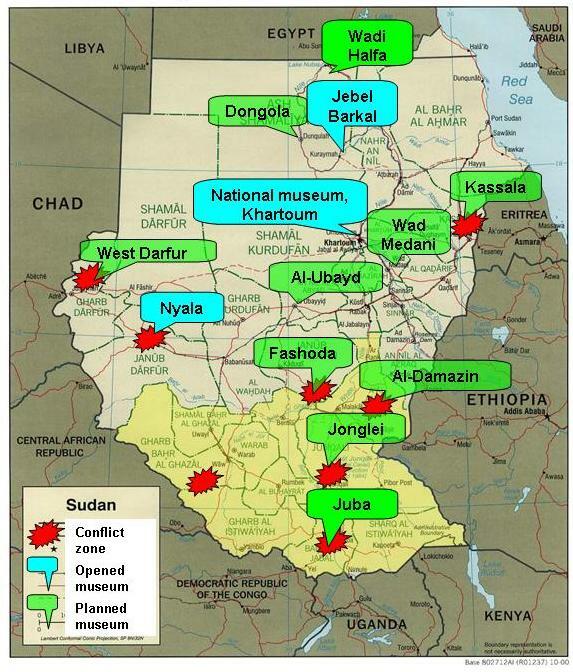 It deals with Sudanese politics in the transitional period 2005-2011, ie. between the signature of the 2005 Comprehensive Peace Agreement that put an end to the North-South civil war in Sudan and the 2011 Referendum on the would-be independence of South Sudan. It shows how the concept of heritage was promoted to assess the resolution of identity in Sudan. The idea of authorities and international advisers was to promote the idea of cultural diversity as a peaceful matter of national unity. It aimed to address the North/South cultural gap and heritage vacuum inherited from colonial patterns: archaeological historical tangible heritage in the North, anthropological “unhistorical” intangible heritage in the South. The problem the actors involved in the process have been confronted with was to define a Southern cultural identity and their inability to think in terms of diversity. This article critically examines the political instrumentalisation of identity and cultural heritage in the Sudanese context. After 50 years of civil wars portrayed as a conflict of identities, cultural identity is supposedly being used in an opposite way. The peace implementation process following the signature of the Comprehensive Peace Agreement in 2005, invokes cultural identity for a wide societal project of reconciliation through the recognition of cultural, religious, and linguistic diversity through a policy of cultural heritage-making. Museums are being constructed and new fields of heritage, such as intangible heritage, are being created. Through the assessment of the concept of heritage as a mean of political recognition, it will be possible to understand how the Sudanese authorities, as well as dissident groups, are using the heritage-making process as a political resource and a means for pacification or, on the contrary, for political contest. Read the article on revues.org. A (very) short follow up. In January 2011,following the roadmap set by the CPA agreement of 2005, the referendum on the independence of South Sudan was held. Southern Sudanese have voted for independence. Many issues are to be solved before the South Sudan can enjoy it’s full independence. Among them are the water resources issues: How Nile waters will be allocated to Southern Sudan? Will Southern Sudan look towards upstream riparians rather than downstream riparians? Politics of Identity remain a central issue. With frequent ethnic clashes, the resuming of a civil war in Southern Sudan is at risk. The Merowe Dam was inaugurated on March 3, 2009. People are still resisting in the 4th Cataract area.